From hippie-dippy bowls of healing food to starcharific Polish staples, this intersection of creature comforts has it all. Okay, I’ll admit until recently I was clueless about this Far Northwest Side ’hood. But then a longtime resident and friend started going on about all the cool ethnic markets, great independent restaurants and friendly bars—and even friendlier prices—so I decided to check it out. While I’m not sure why there are so many dental clinics (I counted 15) clustered in such a small area, I now know where to head for my next cleaning. Aside from gleaming up those pearly whites, you could also add “eat,” “drink” and “eat more” to the list of things to do in Gladstone Park. The electronic sign outside 1 Andy’s Deli (5442 N Milwaukee Ave, 773-631-7304) lays it on thick when it flashes, “We have it all.” But step inside this European-style market and you’ll agree. Linger among the jars of pickled herring, vats of sauerkraut and frozen pierogi, but don’t leave without a stop in back for housemade sausages. Take a break in the small café next to the deli over a plate of goulash or Flintstone-sized pork shanks. 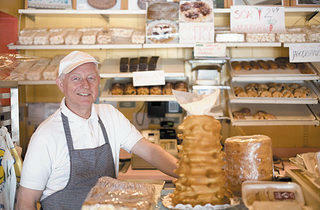 Take dessert elsewhere by wandering next door to 2 Sweet World Pastry (5450 N Milwaukee Ave, 773-792-5566). 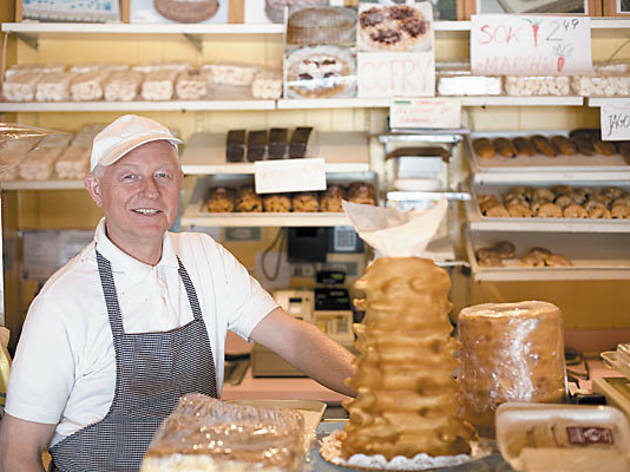 Owner/baker Adam Ryba is proud of his Polish-style baked goods, including the doughnut-like paczki and jam-filled kolaczki. But it’s his baumkuchen, or “tree cake,” that really gets him talking. Like pound cake but flakier, the tall, multilayered pastry takes a couple of days to make—call ahead to order one. It’s a bit of a trek to 3 Phil’s Pizza D’Oro (5800 N Milwaukee Ave, 773-763-2285), but that’ll give you time to work up an appetite for its crispy thin-crust pizzas and rich lasagna. Odds are you won’t see the restaurant’s namesake at this family-friendly BYOB, but you will find plenty of his Sicilian-born siblings and in-laws working the joint. Ask nicely and Rosa Randazzo will give you a kitchen tour if you’re interested. From the outside, with its faded awning and lack of signage, 4 Kazik Bakery (5808 N Milwaukee Ave, 773-631-6897) doesn’t look like much—heck, inside doesn’t look like much either. But it’s the made-fresh-daily loaves of cranberry-walnut bread, multigrain and signature ryes that’ll bring you back. Thirsty? We thought so. It’s just a short stroll to 5 Jet’s Public House (6148 N Milwaukee Ave, 773-792-2440), where you’ll find friendly locals hanging out in a cozy neighborhood spot. Settle in on the cushy banquette with a game of Clue or Yahtzee, or make new friends at the bar. Offer to share your mini corn dogs and you’ll have a friend for life. If you prefer brown rice over pub grub, head across the street to 6 Amitabul (6207 N Milwaukee Ave, 773-774-0276) for vegan Korean food. Chef/owner Bill Choi has earned a loyal following of regulars who swear by the healing powers of his food and freshly squeezed juices, stopping by a few times a week for spicy combinations of vegetables and broths. Up the feel-good vibe and order a Buddhist spiritual reading with your 9 Ways to Nirvana Noodle Soup. Unless tofu gets you going, seek out a bit more romance a block away at 7 Pasta D’Arte (6311 N Milwaukee Ave, 773-763-1181). Be sure to get a table in the garden room (complete with retractable roof) or grab a seat in the intimate back bar, and don’t expect your average red-sauce joint. Owner/chef Mark Gianni likes to mix the classics—grilled calamari, braciole di carne—with specials like pumpkin-filled ravioli in a creamy balsamic sauce or braised short ribs. For a meal with a side of hype, there’s always 8 Superdawg Drive-In (6363 N Milwaukee Ave, 773-736-0660). But there are reasons people line up for this place, the eerie boy and girl hot-dog figurines on the roof and the kitschy carhop service included. Buy a hot dog and cross it off your to-do list already. Now that you’ve fulfilled that rite of passage, turn around and head back down Milwaukee until you hit Elston. There, among the quaint bungalow homes and well-kept gardens, you’ll spot 9 Smak Tak Restaurant (5961 N Elston Ave, 773-763-1123), a cross between a mini ski lodge and a Polish grandma’s house, complete with faux fireplace, plastic flowers and plants. Decor aside, the huge portions of comfort food, from potato pancakes to pierogi, are among the best versions in town. Looking for something lighter? Stroll to 10 Pier 5736 (5736 N Elston Ave, 773-774-3663). The fact that owner/chef Patrick McCarthy proudly boasts his kitchen lacks a walk-in cooler means you’ll find only superfresh fish and seafood at his casual two-room restaurant. Regulars know to order the crab cakes and lake perch, to call a couple of days ahead if they want something not on the menu, and to razz McCarthy when his White Sox lose. Finally, reward your adventurous spirit with a stop next door at 11 the Nil Tap (5734 N Elston Ave, 773-594-1288), which gets its name from the backward spelling of the names of the sisters, Lin and Pat, who own it. There you’ll find representation from both the silver-haired set and twentysomethings, who appreciate the low drink prices, multiple flat-screens and tasty cheese dip that comes with the free pretzels. We think you will too.